Last month, I attended eTail West 2016 to better understand the lives of our retail customers. I wanted to hear their pain points, challenges and the trends driving the industry. My goal, like any Product Manager, is to build products and features that address those pain points and challenges. And of course, to stay ahead of trends, of which there were several that permeated the conference. Focus your messaging on the “why” and not the “what”. Demonstrate how your product makes the customer’s life better. Reduce friction. Everything from optimizing page load times to integrating PayPal as a payment option. Everything and anything to make it easy – online, in store, and in the app. Use responsive design to optimize the mobile experience. Various speakers had various statistics, but a large percentage of purchases are being either researched and/or conducted on a mobile device. So make sure the site – and the emails you send! — both utilize responsive design to accommodate different mobile devices, screen sizes, and resolutions. Leverage technologies. For example, location information and/or beacons to better serve the customer in the store, smart banners on the mobile site to either open the app (if installed) or encourage app download. Encourage conversation. The concept of a brand having a conversation with their customer or telling a story isn’t new, yet it’s still very relevant. However, what stood out was the idea of fostering conversations between customers about the brand. So, not just employing social media to promote and amplify the marketing message, but having customers promote and amplify the marketing message on behalf of the brand. For example, a great way to keep those conversations going could be to send emails to your most engaged customers to encourage them to talk about your brand on social media while offering a reward for doing so. Personalization. There was a lot of chatter about personalization. In walking the exhibit hall, every vendor talked about personalization in some way, shape, or form. Some talked about personalized content, others talked about segmentation and some spoke about analyzing data to drive personalized advertising on their site or via other ad networks. As I approached each exhibitor I always asked the question, “What do you do and how is it different from everyone else here?” Of course, everyone had their own secret sauce on algorithms they use to do personalization. However, the real question was, how should one use that information? How could they help the retailer make that data actionable? SmarterHQ: Enables the retailer to make informed product recommendations to site visitors even if they’ve never visited the retailer’s site. Custora: Reduces customer churn, wins back lost customers, and converts one-time buyers into loyal, repeat shoppers. A lesson from Forrester on why segmenting your list doesn’t cut it. What really drove the point home was attending the presentation by Forrester’s Brendan Witcher. The quick summary is that segmenting your visitors or customers into groups doesn’t cut it because with any segment, the content you send to any specific individual is still likely to be wrong most of the time. The goal is to send EACH person the content that is right for them, at any stage of their journey, whether they’re first-time browsers, repeat visitors or long-time customers. This is individualization. You do this through contextual data, third party data (where has that visitor been before coming to your site), and of course, your own visitor and purchase information. Batch and blast can be costly and inefficient. This mode of thinking requires a re-think of how you work with your ESP. Today, many marketers are still sending a batch email, collecting the data, doing the analysis, deciding on what to send next and then developing a new message based on those findings. Lather, rinse, repeat. This cycle is too slow to engage your customers, and site visitors who may have moved on to a competitive product by then. It’s also expensive. Every time you develop a new template – it’s hours of someone’s time you’re paying for – either employee, contractors, or outside agencies. Decide on your most important lifecycle journeys, develop the messages that nurture your visitors and customers on that journey, and then trigger those messages in real time. Content can be personalized in real time. Not only is each message more relevant and more likely to serve up the correct content for each individual, but your email development costs are likely to fall since you won’t be developing a new creative template for every send. As you learn more about your customer journeys, you can refine the business rules that drive them, and develop new templates. 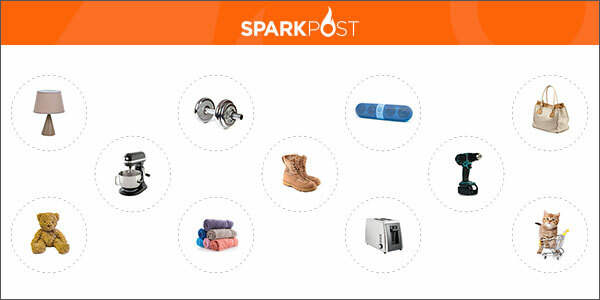 Companies like Iterable, BoomTrain, and the ones mentioned above can do the heavy lifting on the personalization (what to send and to whom) while SparkPost handles the delivery to make sure the message goes in real time — and lands in the inbox. How will I be incorporating what I’ve learned in the days, weeks, and months ahead? By researching all of the great companies I talked to (or whose swag I brought home), and determining which partners deliver on these themes for our customers. Which companies would you recommend to drive personalization? Glad you enjoyed the presentation and the event! Thanks for the write-up.